If you have ever clicked on our Ring Sizing Help link, and/or ordered our $2.00 Ring Sizing Kit, you may have noticed that we recommend ordering one size larger in wider rings. So, what is a "wider ring" anyway? 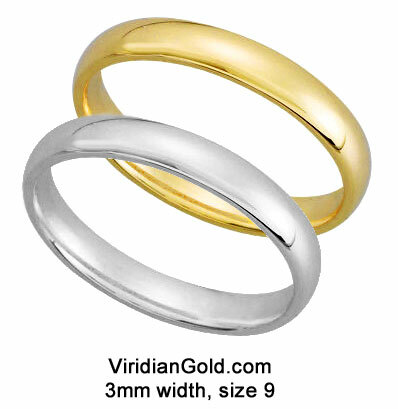 A great example would be the wider styles in our Domed Gold Wedding Bands. In our ring size kit, the "rings" that you can try on are about 3.5 mm wide, so that could be a big difference compared to, say, a 7mm band. So, why do you need to order the wider bands a little larger? It's because the ring must slide over the knuckle of your finger, and the knuckle is wider than the rest of the finger--but that is good, because it keeps the ring from slipping off the finger (unless the ring size is too large)! The wider the ring, the more it must compress the skin that surrounds the knuckle as it passes over it. 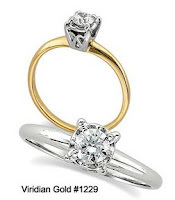 A narrow ring does not have to compress as much skin. 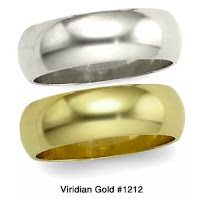 This is one reason why many rings are "tapered", that is, the bottom of the ring is narrower than the top of the ring. The narrower portion makes it easier to put on, but it retains the wider appearance on the top of the ring where it is most visible. 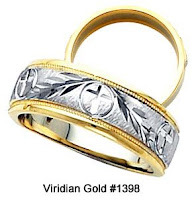 Our Triumph Wedding Band, #1398 is a tapered design, about 7 mm wide at the top of the ring. Also, you should always measure your ring size when your hands are warm and are at their largest size, which is usually in the late afternoon. Women should keep in mind that their finger size will also increase during their monthly cycle. And, finger and knuckle relationships can vary from person to person--so make sure your ring is snug enough so that it will not slip too easily over your knuckle, or you risk having the ring fall off your finger without you realizing it!